The choir sings the weekly Sunday morning Solemn Mass at 11:00am, as well as the main Christmas, Holy Week and Easter liturgical celebrations. Established in the 1999, the semi-professional choir is made up of former university choral scholars as well as singers who perform with other chamber choirs in the city, and those who work in the music industry. The repertoire extends from Gregorian chant and polyphony through to contemporary mass settings and motets by composers such as James MacMillan, Colin Mawby, Malcolm Archer and Andrew Wright. The choir sing Mass at Westminster Cathedral every year and in 2011 they were invited to sing the National Mass of Thanksgiving there, celebrating the 900th anniversary of the founding of the National Shrine of Our Lady at Walsingham celebrated by the Archbishop of Westminster with the Papal Nuncio and diocesan bishops and clergy. Together with members of the Latin Schola the Parish Choir have produced an acclaimed commercial CD of sacred music in honour of Blessed John Paul II (see ‘Recordings’). The church and choir now broadcast live regularly for BBC Radio 4’s ‘Sunday Worship’ and ‘Sunday Half Hour’ on BBC Radio 2. New members of the choir are always welcome following an audition. A high standard of sight-reading is required. The choir rehearse at 9:30am on Sunday mornings. For further details and to arrange an audition please contact the music department. The Schola Cantorum sings the weekly Sunday Solemn Latin Mass at 6:30pm. A wide range of music is performed, almost exclusively in Latin. The repertoire includes a substantial amount of Gregorian Chant, polyphonic mass settings and motets by some of the great composers of sacred music – Palestrina, Victoria, Lassus, Tallis and Byrd etc. 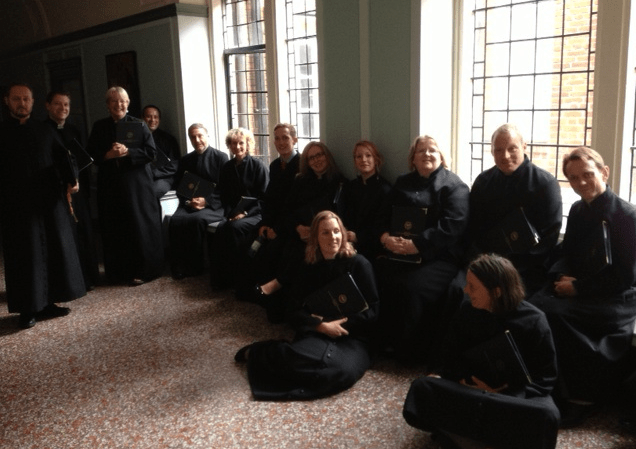 The Latin Choir has been an important feature of parish life for some thirty years. The choir was reconstituted and then directed from 2005-2006 by Colin Mawby KSG, a former Master of Music of Westminster Cathedral. Many members of the choir are former university choral scholars and members sing with other renown choirs in Cambridge and London. There is also a list of deputies who are willing to sing in the choir from time to time. Entrance to the choir is by audition and a high standard of sight reading is required. The choir rehearses on Sunday afternoons from 4:45 to 6:00pm. For further details please contact the Music Office. And find out whose who in the Music Office.